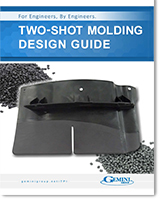 Two-Shot Injection Molding Tooling Design & Build | Thumb Plastics, Inc.
At Thumb Plastics, we design and build all injection molding tools in-house. 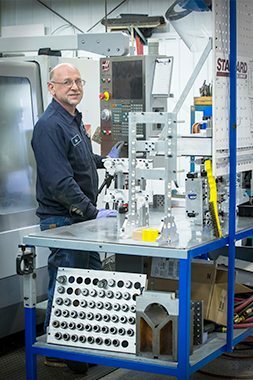 Our injection molding design capabilities allow us to provide rapid prototypes of your parts as well as eliminate wasted time and cost associated with shipping your mold to different facilities for tooling or engineering purposes. This means faster implementation of engineering changes and shorter time to market for your injection molded parts. Our customers also enjoy the benefit of Convertible Tooling. One of the first steps Thumb Plastics takes when developing any new injection molding design project is Stage Tooling. This involves assessing the feasibility of building prototype tooling that converts to production tooling. This eliminates redundant tooling investment and further reduces lead-time. Thumb Plastics has FEA engineers on staff to aid you in optimizing the design of your injection molded parts to maximize performance while driving cost out.